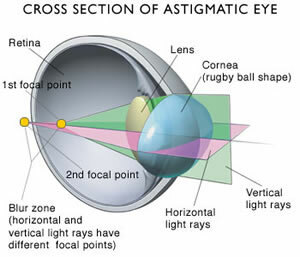 It is common for patients to have astigmatism before laser cataract surgery. The good news is that a special category of intraocular lenses, also called ‘Toric IOLs’ help in the effective correction of astigmatism during the cataract surgery. Even though astigmatism is not related to cataract, it can be corrected during the performance of the cataract surgery. Your doctor will trace the shape of your cornea using a special diagnostic technology (corneal topography) and estimate the extent of correction required for your eyes if you were to wear eyeglasses post surgery. This allows him/her to include the estimated amount of correction into an artificial lens. This is termed as a ‘toric lens implant’. Toric IOLs have a variable power in different lens meridians just like soft toric contact lenses. There a few important differences between the cataract surgery done with Toric IOLs and the traditional surgery. The surgery however, is highly safe and highly effective. Medical studies suggest that there are no extra medical risks associated with toric lens implants and that it is an absolutely safe procedure. Toric lens implants are single-focus lenses. This means that there are less halos and other visual side effects. Toric lens implants do not interfere much with the standard cataract surgery and the length of the procedure largely remains the same too. Further, there is no extra recovery care that needs to be taken in case of toric lens implants. Toric lens implants allows astigmatism patients to enjoy better vision during the early stages of post-surgery recovery while they are still waiting for their prescription eyeglasses. Toric lens implants come with distinct markers on the lens periphery. These markers allow your surgeon to view direction of correction in a lens. After the surgeon implants the toric IOLs in the eye, the lens is rotated to allow for proper alignment in order to get optimum results. It is critical for the toric lenses to be accurately and securely positioned during the laser cataract surgery. The lens should not rotate post implantation. Patients are advised to select an experienced surgeon when getting a toric lens implant because even though the procedure is highly safe, the way it is performed could have a significant impact on the results. Even tiny errors related to positioning may have an impact on visual acuity.